Sarfaraz and Shakib from Cryptic Fate. Needless to say, the idea of concerts has always been a very popular one in our country, With new bands forming almost every year, these concerts are taking place more often than before. However, there are differences in concerts depending on whether the crowd control is sound, the organisation, security and so much more. 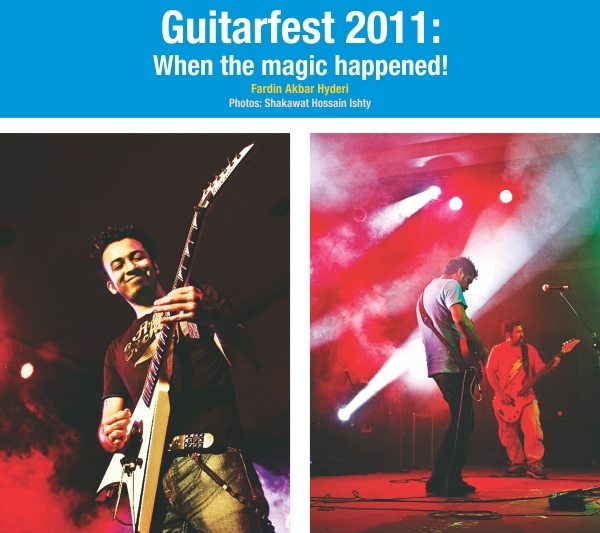 Guitarfest 2011, held on September 9, presented by Boombox, was a great concert which did not lack in any of the dilemmas mentioned above. Watching the concert from A to Z was a spectacular treat for the audience. Held at the Ruposhi Bangla Hotel, this concert was unlike any other concerts organised since 2007. The aim of this concert was to provide guitarists with a platform where they could please their fans with face-melting lead solos and amazing skills. During the performances, there were flames from different sides of the stage. One could only imagine how awesome the view was with guitarists like Rafa from Aurthohin, Saadi from Kraal, Maher from Nemesis, Oni from Warfaze looked playing solos along with these flames in the background. The organisers came up with the idea to promote guitar enthusiasts to upload their solo videos on their facebook pages, out of which they promoted two of the best. Zehin and his friends Shovon, Anik and Baiyazid were the lucky ones. Inspired by Yngwie Malmsteen, Zehin played his heart out in his lead solo with his friends along with him. Besides these, the concert was full of many little surprises. 'The Bench', the music café in Gulshan 1, Dhaka served snacks during breaks, along with playing games in Playstation and Xbox consoles. A magazine, with interviews and messages from the performers was also handed out to the audience. The volunteers were extremely decent and were always present to help clear any hassle or distress. The concert had some moments which drove the audience insane, literally. One of those moments were where Rafa and Saadi, siblings who play in separate bands got together and performed on stage. The audience literally lost it when one of Warfaze's first performers appeared on stage as a surprise. Shaker Bin Shams, Rafatul Bari Labib and Nabil Khan, organisers of the 'Boombox,' were the ones who were on their toes through out and without whom this event would not have been possible. "We all know our country lacks a great deal when it comes to entertainment. Our (Boombox) main goal is to make our small city happening, with live music," the three shared. Majedul Islam, Chief Advisor of Guitarfest said, "Guitarfest is a unique event designed to celebrate music, musicians and musicality. On its 4th year, we are celebrating some of the most talented guitar players in the rock music industry. We dedicate this event to those music lovers who enjoy music from their hearts." 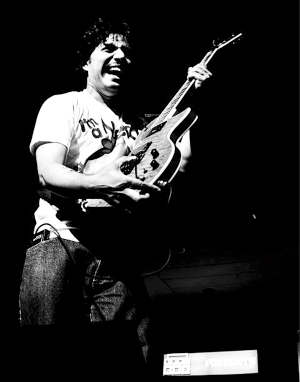 Guitarfest'11 presented by Boombox, was one of those concerts which started and ended successfully. Presenting not only one amazing band, the concert gave the audience an opportunity to enjoy music of 10 different bands along with aspiring guitarists chosen from auditions. The invitation was sent via Facebook and tickets were available at 'The Bench' music café for Taka 700 only. The concert was an inspiration for young musicians who dream to perform on the stage, some day. If one is disappointed for not making it to this concert, then he or she should not worry since this is not the end of Guitarfest. Next year, Guitarfest will be organised by Boombox again and would be looking forward to managing international bands along with our talented locals.